The Centre for Textile Conservation is part of the Centre for Textile Conservation and Technical Art History, which opened in 2010; it is led by Professor Frances Lennard. This is an exciting development that is taking the TCC's legacy forward in new and important directions, and has brought university level conservation education to Scotland for the first time. The Centre offers the internationally renowned MPhil Textile Conservation, a two-year full time programme, as well as MLitt Dress and Textile Histories and MLitt Technical Art History, Making and Meaning. In September 2018 a new programme will develop the Centre's work even further: the MSc in Modern Material Artefacts will be the first course to address the issue of modern materials in textile, social history and other collections. If you would like more information about the Centre or about any of these postgraduate programmes please do contact the University of Glasgow's admissions department at: pgadmissions@glasgow.ac.uk. This 3-year research project, led by Professor Frances Lennard and funded by the AHRC, aims to transform our understanding of Pacific barkcloth manufacture using a multidisciplinary approach. Project partners include: Kew Economic Botany Collection, Hunterian Museum and the Smithsonian Institution. This 3-year project, led by Frances Lennard and funded by the Leverhulme Trust, focuses on conservation and display of tapestries. The Centre's partner is the University's Engineering Dept. 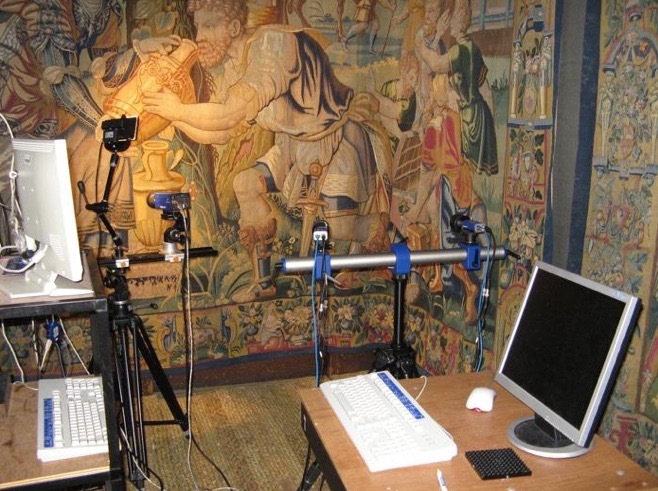 and uses digital image correlation and other techniques to monitor the effect on tapestries of display and of different conservation techniques. Among the dye projects being led by Dr Anita Quye, Senior Lecturer in Conservation Science are research into: dye manual and pattern books, 1700-1900; early synthetic dyes 1850s-1900; development of techniques to analyse historical dyes; the effect of light and pollution on historical dyes, and its mitigation.